Hippophae Rhamnoides, the Sea Buckthorn bush, originates from the Himalayan Mountains of Nepal but has now spread to many other parts of the world. The botanical name hippophae comes from ancient Greece where it was fed to horses and means ‘shiny horse.’ In Kashmir it is known as tasru (wonder plant). Sea Buckthorn has long been revered as a food, tonic and medicine in many ancient cultures including Chinese, Tibetan and Mongolian. The shrub can withstand frost, wind and salty soils and its abilities to survive harsh and unforgiving climates produce bright orangey yellow to red berries that are exceptionally high in medicinal and nutritional elements. 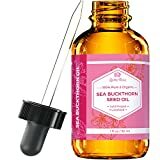 There are two sources of Sea Buckthorn Oil – the seed and the fruit pulp, which has an unusually high oil content that always exceeds that of the seed. Sea Buckthorn Oil has an exceptionally high essential fatty acid composition with about 70% consisting of linoleic and linolenic acids in more or less equal amounts. It also contains palmitic and palmitoleic acids, a generous dose of tocopherols (vitamin E,) as well as tocotrienols, plant sterols, carotenoids and flavonoids, including quercetin, rutin and myrecetin, vitamins K, C and D, amino acids and trace minerals iron, zinc, calcium, potassium, manganese, selenium, copper. In fact Sea Buckthorn Oil has some 190 elements in a complete synergistic package that can be considered a functional food. Sea Buckthorn Oil aids the endocrine, circulation, immune, nervous and digestive systems. It has potent antioxidant benefits which are vital for good cardiovascular function and it helps normalise cholesterol, balance blood sugar, blood pressure, hormones and gastric secretions. It is also hepatoprotective in that it normalises liver enzymes and protects the liver from toxic chemicals and drugs. It is anti-tumour, protects against the effects of radiation and because it promotes white blood cells, is a general immune booster. Sea Buckthorn is so chock-a-block with important nutrients that it is beneficial for any sub-health condition caused by vitamin, mineral and fatty acid deficiencies. Sea Buckthorn Oil is particularly effective at treating burns and skin disorders, both topically and internally. It is good for wound healing, pain relief, inflammation and tissue regeneration in conditions such as acne, dermatitis, scalds, wrinkles, ulcers and in dry, irritated, thin or malnourished skin. Sea Buckthorn Oil is an ingredient in anti-ageing creams, hair and nail care products and natural sunscreen formulations for its antibacterial, UV protectant, soothing and healing abilities. In capsule form, Sea Buckthorn Oil is used for the treatment of gastric ulcers, constipation, liver function, esophagitis (caused by radiation) and for general health and wellness. Mix all ingredients and massage in to hair. Leave on for 2 to 3 hours or overnight before shampooing. In the shower, wet your skin and then massage the mixture all over your body. Rinse off first with warm water and then, to boost circulation, wash with cold water. Put the ingredients into a bottle with roll-on top. Shake before applying to the burn.